Ground shipping only. The perfect product for cleaning hard-to-reach or sensitive surfaces! 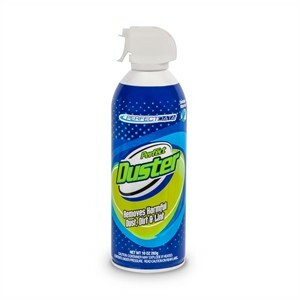 Perfect Duster compressed air duster is the ideal way to remove dust, dirt, and other particulate matter from areas not suitable to be cleaned with brushes and swabs or liquid cleaners. Easily clean computer components, office equipment, home electronics, photo equipment, and more! CFC-free, complies with 16CFR Fed. Haz. Substance Act C.P.S.C. Regs. as non-flammable.